Make these easy and delicious Chicken Chimichangas for a meal everyone will love! 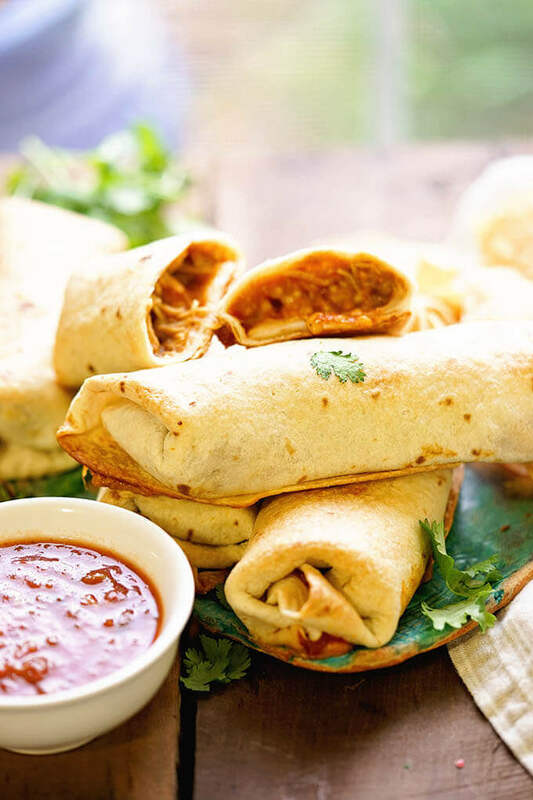 Shredded chicken, refried beans, cheese, salsa and spices rolled up burrito style and baked until crispy, topped with salsa, sour cream and guacamole! 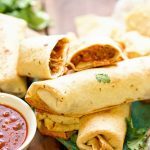 Chicken Chimichangas are easy to make and everyone loves them! So this week I’ve shared recipes for Slow Cooker Chicken Tacos and Slow Cooker Chicken Taco Soup. And let me tell you, these meals are amazing! I love it when you cook once but get to enjoy three totally separate meals, don’t you?!!! So if you love those meals, you’ll love this one too and it’s actually Dan’s favorite of the three. It’s my favorite because it’s so easy to make AND so flavorful! So one quick question first. Did you put away the extra chicken taco meat? Yes, perfect! No? That’s ok! You can totally substitute with cooked shredded chicken breast. Even rotisserie chicken will be delicious! 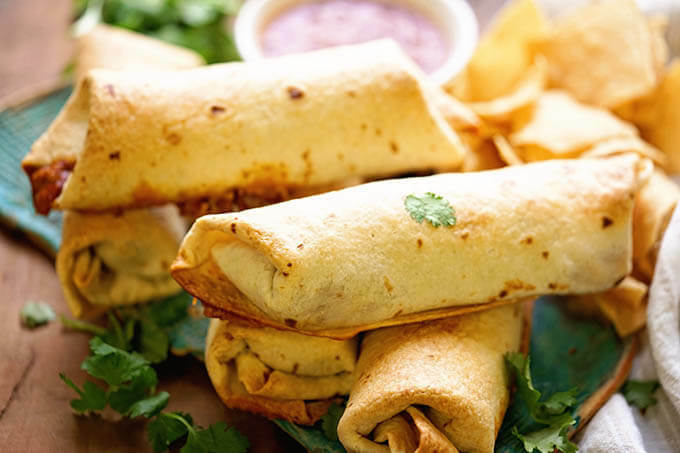 Read on to learn how to make chimichangas! It’s sooo easy! I was telling my friend Ang what we were having for dinner the other night and she said, “what is a chimichanga?” She lives on the east coast and had never heard of them before! So if they are new to you also, let me explain! It’s like a burrito stuffed with beans, meat and cheese. Then deep fried until golden and crispy and let me tell you…. they are delicious! My recipe is easier and healthier because we bake them – frankly, I think they are better that way too! No greasiness and they aren’t near as heavy! You will love them, I promise! What’s the difference between a burrito and a chimichanga? The biggest difference is burritos are not deep fried. Other than that they are quite similar! If you love a burrito, this will be a new favorite! Not really no. Of course, you can spice it up with jalapenos or spicy salsa. It’s up to you! Prepare a non-stick baking sheet by spraying with Pam or another non-stick cooking spray. Drain the chili beans and mash them. Add the chicken and mix together. Make an assembly line and prepare each tortilla filling them with the meat/bean mixture, enchilada sauce and shredded cheese. Fold in the sides of the shell and then roll them into a package. Lay on the baking sheet. Continue until you’ve exhausted your supply of ingredients, laying each one on the baking sheet seam side down. Before putting this into the oven, spray the tops and sides or brush the shells with olive oil also. Bake until golden and crispy! I topped them with both red & green salsa (my friend Michelle calls this a Christmas sauce when you use both) avocado and cheese, paired with a green salad. Another easy weeknight meal! This makes eight, so there’s certainly enough for a party! The very last night, I took the chimichangas and covered them with just a bit of leftover Chicken Taco Soup and baked them. When they came out of the oven, I topped them with sour cream – so kind of like a fancy burrito. This was actually my hubby’s favorite of the two, so technically there were four separate meals made with the shredded chicken meat! Serve them with your favorite salsa – red or green! More of my favorite Mexican meals and flavors! When you make this, please tag me on Instagram @bowl_me_over or #bowlmeover – thank you for supporting the blog, trying and sharing my recipes! Save money and stretch a buck with these easy Chicken Chimichangas. Authentic flavor and an easy meal! Prepare a non-stick baking sheet by spraying it liberally with a non-stick coating or brushing with olive oil. Drain the chili beans (do not rinse) and mash them up a bit. Add the chicken, sprinkle with the taco seasoning and mix together. 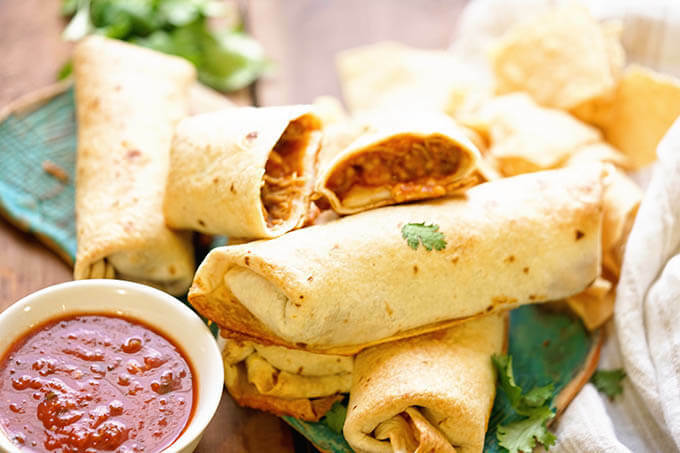 Make an assembly line and prepare each tortilla with taco meat, beans, enchilada sauce and shredded cheese. Fold in the sides of the shell and then roll them into a package, burrito style. Lay each on the baking sheet. Continue with the remaining ingredients, laying each one on the baking sheet seam side down. Before putting them into the oven, spray the tops of the shells with non-stick coating or brush with olive oil, making sure they are well covered. Bake for 20-25 minutes until they are golden and crisp. Finish with your favorite toppings and enjoy! « Steakhouse Salad: No boring salads here! I love, love Mexican! This is my kind of meal! This is a great combination of great foods and easy to fix. Love them all. With the basic done in the crock pot it makes for an easy week for cooking. Yes, sums it up! Anything to make the weeknight meals easier I say! Wow you really put that chicken to work making 4 meals out of it. All the meals look so delicious but I would have to say the chimichangas would be my favorite. The tacos would be my kids favorites. Sounds wonderful! I love using my slow cooker, pinning! I know, using your slow cooker feels like cheating huh? 😀 Love making meals easier!!! Awesome, thanks Pam! I really appreciate you stopping by!!! That chicken looks succulent. I love chimichangas! I want a plate please. Your shredded chicken looks amazing. I love chimichangas. you had me at slow cooker…. 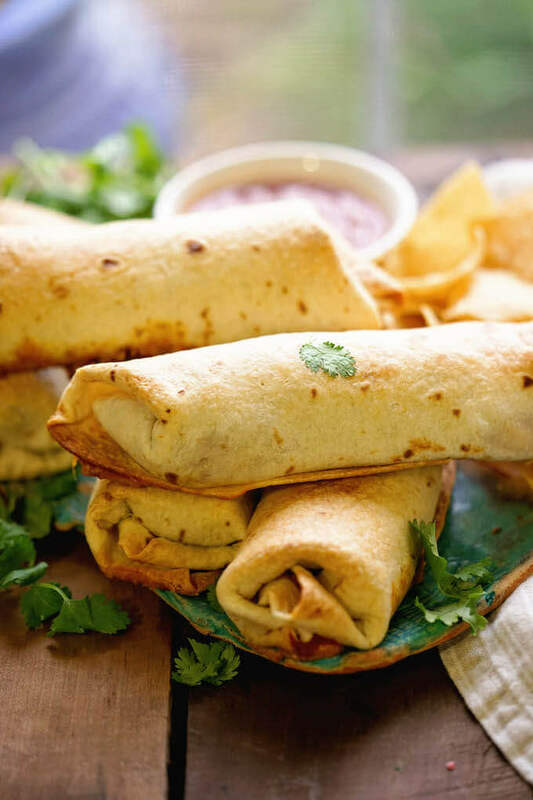 i love chimichangas this recipe looks great! Anything to make life simpler! Thanks Lizzy! I love Chimichangas. These look delicious! Great, I hope you enjoy it Elena! This has so many good flavors combined in this great dinner. Love the way you have come up with the different idea of how to use the chicken. OMG these look so good!! I love these!! !